A Little Time and a Keyboard: There's Going to be an Eggstravaganza! There's Going to be an Eggstravaganza! Easter is such a fun time for kids. Everything is so brightly colored announcing the great spring weather to come. 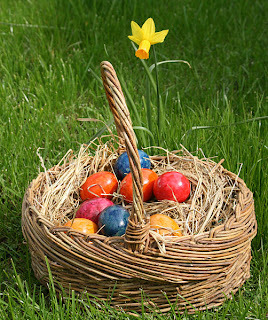 Kids love visiting the Easter bunny and greatly anticipate Easter egg hunts and receiving Easter baskets on Easter morning. If you are looking for a fun family event on Easter morning, think about attending the Eggstravaganza at Faith Lutheran Church in Arlington Heights. The function will feature stories, songs, and a lively Easter egg hunt and is free! The Eggstravaganza is on Easter morning, April 8th, from 9:45AM-10:30AM. The egg hunt will be held either outside or inside depending on the weather. So no matter the weather, kids will be in for some Easter fun! If you are interested in worship services, a contemporary service will be held at 8:30AM and a traditional service will be held at 11:00AM. There will also be an Easter breakfast held at 9:30AM. Kat and I have attended a number of family events at Faith with our girls and they have loved them each and every time. Faith's events really give you the feel of being part of a family and the kids just love participating in the activities. Faith Lutheran Church is located at 431 S Arlington Heights Rd. in Arlington Heights. If you have any questions about the event, please contact the church office at 847-253-4839. I live way too far haha. But I am looking forward to Easter Sunday!